Recently I came across the following heartbreaking video concerning the abandonment of 50,000 chickens, living sentient beings trapped in tiny wire floor cages abandoned and left to starve to death. Watch the video of the rescue in 2012 of some of the birds – sadly out of 50,000 only about 4,000 were able to be rescued thanks to the determination of Animal Place volunteers. Again back in 2012 half a million chickens died in a fire on an egg farm near Roggen, Colorado at Moark Hatcheries. Image the horror, the terror the pain of these helpless animals trapped unable to escape. Both of the cases above and many others are shocking disasters which are often preventable. The first was claimed to be lack of communication about who was supposed to feed the birds, the second was a fire one of many that are experienced in factory farming in some cases by heating equipment malfunctions or placement too close to flammable material. However notwithstanding the truth of the matter concerning these tragedies the day-to-day suffering of these animals for the duration of their entire lives – about two years for a hen who will be sent to slaughter when she is begins lay fewer eggs – is a tragedy itself . 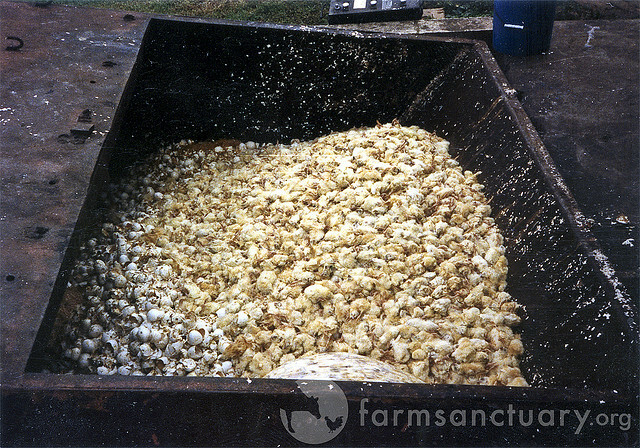 For the duration of these two years hens, having previously had their beaks painfully clipped, are cramped together in tiny cages with 8 or 9 others birds on wire floors stacked one on top of another, standing in their own feces, sometime with the decaying bodies of dead hens. They have never seen the light of day, the warmth of the sun. They have never felt a cool breeze ruffle their feathers, they have never walked on earth or took dust baths as is natural for chickens. Their entire life experience is a tiny cage like the one below where they will lay 200 eggs each year – normally a hen lays about forty to fifty eggs. What of the male chicks ? Shockingly male chicks are ground up alive, suffocated or gassed because they cannot lay eggs and they are not suitable for chicken-meat production. “Along with defective and slow-hatching female chicks, they are trashed as soon as they hatch. Upon breaking out of their shells, instead of being sheltered by a mother’s wings, the newborns are ground up alive, electrocuted, or thrown into trashcans where they slowly suffocate on top of one another, peeping to death while a human foot stomps them down to make more room for more chicks. Please watch the video above. Consider if you consume eggs you are complicit in this appalling cruelty to thinking feeling creatures capable of experiencing pain and fear, capable of suffering every single day of their short miserable lives. From the vegan society advice recipes and information. Take the pledge. 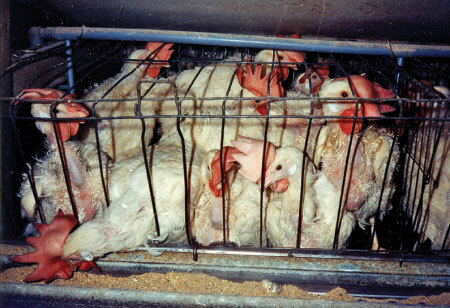 Generations of gentle hens have been locked in cruel & unnatural battery cages. Right now, we have a chance to get them out. “The natural life span of a chicken is six or seven years. The original ancestors of chickens produced as few as twelve to twenty eggs each year . Domesticated chickens originated from red jungle fowl, forest dwelling birds of south east Asia. Modern chickens despite selective breeding retain many of the natural behaviours of their wild ancestors. Read more: http://thinkdifferentlyaboutsheep.weebly.com/factory-farming-chickens.html This article includes images which some people will find upsetting. This treatment of sentient animals is evil, pure evil there can be no excuse, no justification. The motivation is profit of course, as is everything nowadays. Such barbarity has no place in any civilized society. If you eat eggs – and don’t forget in most biscuits, cakes, puddings and any baked product there are eggs – you are contributing to this cruelty and it will never end, if we do not make it end we are part of the problem and perpetuate this cruelty. For most of us the most effective way is for you to change your diet and go vegan, doing so not only helps the chickens and other animals but improves your health and the environment. If you are still not convinced that changing to a plant-based diet to become vegan is the right thing to do for the sake of these gentle, helpless birds who are sentient beings like you or I, like your cat or dog, than look at the information below. I have kept this separate as the images and videos below are disturbing and may be traumatic for caring sensitive people who may have in any case made the compassionate choice. This video is deeply disturbing and I could not watch it all. How these people can work day after day torturing and killing these tiny helpless creatures is beyond my comprehension. It is profoundly depressing to see such lack of compassion. It is disturbing in the extreme to know people like this exist and live among us. Wyoming want to charge tourists $6,000 to hunt a grizzly bear! Please add your name to the following petition. 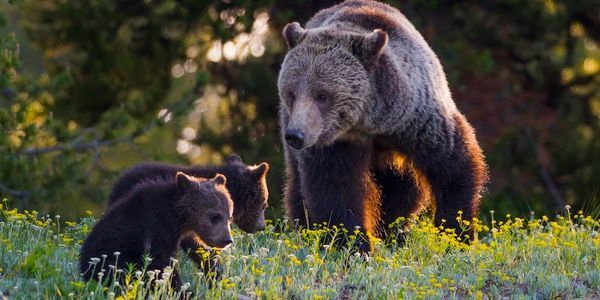 https://www.thepetitionsite.com/978/481/835/dont-murder-grizzlies-%E2%80%93-demand-wyoming-abandon-plans-for-trophy-hunt/?z00m=30034561 – Further down you will find more petitions opposing trophy hunting. Please sign as many of the following petitions opposing trophy hunting as you can. United Nations: BAN Trophy Hunting. STOP Poachers. END Imports. I have to wonder why hunting and indeed all cruelty to animals is allowed to continue despite the overwhelming majority of us who would like to see it banned. Time to ban worldwide trophy hunting, any hunting. We have to question what kind of government allows its citizens to hunt animals, any animal. The killing of other living beings simply for the sickening pleasure of the emotionally challenged, who frankly need to seriously question their psychological health, needs to be questioned and brought to an end. What kind of person enjoys killing a defenceless animal, and in one of the twitter links below one trophy hunter callously displays his sickening enjoyment, what does that say about him or her? How will we ever have a more peaceful and just world for all, human and non human when we allow such atrocities to take place. There is no place in our society for such barbarity. Here are some of the latest trophy hunting outrages you might consider if you are in any doubt, and thankfully the majority of us certainly are not. Yet these atrocities continue as governments do little to nothing to ban them, even condoning, encouraging and sometimes participating as do many MPs here in the UK and in the US Trump of course condones his trophy hunting sons. So that nobody forgets his vile deeds, this is @JimmyJohns's founder Jimmy John Liautaud with a few of his 'MANY' trophies. One of them is rumoured to be the last female Black #Rhino in the Mangetti National Park. The Final Humiliation!!! ……one of the hunter's favourite statements is "we always respect the life of the animal we take" ~ well it DOESN'T look like it! !